CSE2 (Cave Story Engine 2) is a decompilation of Cave Story made by me and Cucky, with an emphasis on accuracy to the original code. Through a combination of machine-conversion and by-hand translation, we've broken the original 2004 EXE back down to a recreation of its original C/C++ source code. 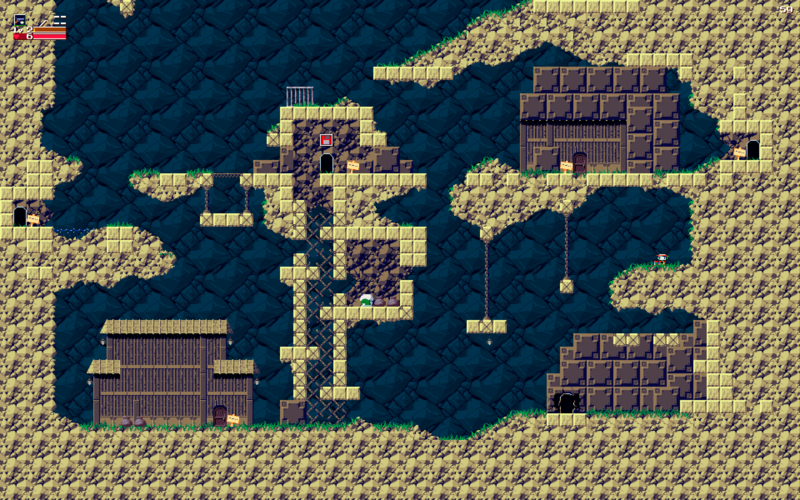 As of yesterday, the game is fully completable: from First Cave to Ballos. You can find the source code here. To compile it on Windows, you'll need an MSYS2 installation with MinGW-w64, though it should be easy to make it compile with Visual Studio. Right now, one of the biggest deviations from the original code is the rebase from DirectX to SDL2. Personally, I plan to make a fork that moves back to DirectX, but for now SDL2 means better performance, and the ability to run CSE2 natively on Linux, so that's a bonus. Hopefully I shouldn't have to explain how being able to work with plain C/C++ code will make advanced code modification easier. Writing a DLL chainloader to patch an EXE file is an absolute nightmare in comparison. Not to mention, this could open up the possibility of a community-maintained base for mods, with fancy things like extra TSC commands and Ogg support built right in. Since this is the first release right after the project's completion, consider this a bit of an open beta. Inaccuracies could have slipped through without us noticing during playtesting. We've got plans in the future to make the code even more accurate (by compiling it with the same compiler Pixel did, and comparing the resulting ASM), but that's for another time. For now, if you spot anything even slightly off, please point it out here. You can download a 64-bit Windows build here. Just add the data folder from the regular freeware version. I suppose I should tell a little story here, about how this thing even got off the ground. Back when I made my DLL loader, I was doing everything blind. I wasn't even using the assembly compendium. Then GabrielRavier(?) found out that the old Linux port accidentally contained debug symbols. These symbols contained the original names of practically every bit of code in the game. With this info, almost everything you'd ever need to know about the game's code was laid out for all to see. It even gave us the names of each C++ file, and which functions they contained. All of this, combined with a good decompiler, meant making a decompilation was just a matter of putting these pieces together. How nifty! Hopefully this will open up the possibility for more consistent frame rates and the like, as I always noticed how wonky CS's frame output was when putting videos together. Is there any way to compile this with normal MinGW, or does it really require w64? it's my understanding that w64 is the "real" mingw now and the other one is just kept around for legacy purposes, so you should probably be using that. So how long 'till this gets Booster's Lab functionality? It'd be pretty neat to just have there be "plugins" that you could add in to your works to bring the engine to greater heights than what is normally shown in a csbd. Compiled it and I have to say it looks amazing so far! I'm rusty though... I couldn't figure out how to set the FPS to 60 to eliminate tearing before needing to quit. Ended up just setting "#define FRAMERATE 16" in Draw.cpp. In any case, well done you two! Did you forget that Noxid probably wouldn't bother to code that in and that nobody else wants to touch java because it's evil. Actually just getting the mapdata moved to a Stage.tbl like CS+ would make it compatible with BL so that's a thing. Also thank you guys for making the sound effects in their own folder, but what about the ORGs, the icons, and the credits bitmaps? But the sound effects aren't in their own folder...? They're in the EXE just like the original. And, again, CSE2's goal is accuracy, so splitting all the files and completely switching to CS+'s stage.tbl format is out of the question. That's a job for the 'community-maintained mod base' I mentioned at the start of the thread. The closest we could possibly do is store stage.tbl in CS+'s format in the source code, and then write a converter that turns it into the vanilla format when the game is built, and embed it in the EXE. That would still leave the issue of Booster's Lab figuring out where the data folder is. Hey, nice work. Keep it up! Nice. Now i won't need IDA anymore.